"Cate, Renee, and Abby have come to New York for very different reasons, and in a bustling city of millions, they are linked together through circumstance and chance. Cate’s roommate Renee will do anything to nab the plum job of beauty editor at Gloss. But snide comments about Renee’s weight send her into an emotional tailspin. Soon she is taking black market diet pills—despite the racing heartbeat and trembling hands that signal she's heading for real danger. Pekkanen’s most compelling, true-to-life novel yet tells the story of three very different women as they navigate the complications of careers and love—and find the lifeline they need in each other." Another reason I wanted to pick up this book is because it is classified as women's fiction. My writing tends to fall under the genre as well and I wanted to stay abreast of what's selling. This was one of those books I didn't want to put down. 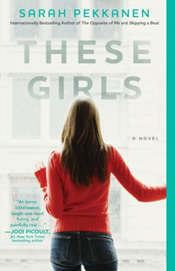 After finishing the novel, I would definitely pick up another one of Sara Pekkanen's books. In fact, I already bought a copy of The Opposite of Me and can't wait to read it. At the bottom of this post you can also click the link to visit Goodreads on your own.